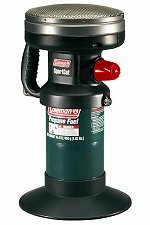 The Coleman SportCat is a great little propane heater for small, enclosed areas. It's light, extremely portable, a cinch to set-up and runs very simply atop a propane cylinder that you can buy at any Wal-Mart or Outdoors store. The platinum catalytic head is specially made to provide a reliable, flameless heat source, and it's extremely quiet, you would hardly know it was on if it wasn't warm. We tested it out on what turned out to be a very rainy hunting trip last fall. Not only did it get to keep the tent (and us) warm, it also got to act as a dryer for our wet clothes. My hunting partner and I were in a 6-man tent with all our gear in early fall (mostly mild temps). It would get probably down into the 50's at night. We would run the SportCat for a little while before lights out, and it warmed up the tent nicely. It also did a great job of helping to dry out the aforementioned wet clothes. The SportCat has a sturdy base that helps keep it from tipping over. It has electronic ignition which makes lighting a snap. It would be great for ice-fishing, tree-stand deer hunting, or other enclosed area cold weather outdoors activities. It's even small and light enough that you could take it on a backpack hunt into the wilderness for emergency use. As always with gas heaters, it is best/safest to have some sort of air ventilation while using. I highly recommend the SportCat - I'll be using it a lot this fall.